Description: Tucked away in a corner of the University of Texas Medical Branch campus stands a majestic relic of an era long past. Constructed of red pressed brick, sandstone, and ruddy Texas granite, the Ashbel Smith Building, fondly known as Old Red, represents a fascinating page in Galveston and Texas history. It has been more than a century since Old Red welcomed the first group of visionary faculty and students inside its halls. 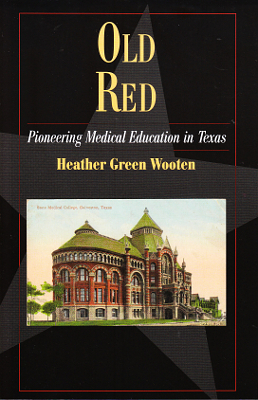 For decades, the medical school building existed at the heart of UTMB campus life, even through periods of dramatic growth and change. In time, however, the building lost much of its original function to larger, more contemporary facilities. Today, as the oldest medical school building west of the Mississippi River, the intricately ornate Old Red sits in sharp contrast to its sleeker neighbors. 136 pages, with notes and index. Viewed: 2,575 times since December 20, 2012.